There are many ways to sound more feminine, and you are likely familiar with one or more of them. Below is a brief explanation of different aspects of feminine communication based on norms in an American English context. These are basic features that do not all apply to all women in all contexts, or necessarily to your particular needs or in all situations you find yourself in. When they do apply to you, they may be shaped in various ways to optimize the feminine aspects of your own speaking style in context. While pitch is not the only feature used to achieve more feminine voice, it is indeed the most critical part. Without a higher pitch, it is very difficult to sound feminine. Studies show that the average cisgender masculine speaking pitch is about an octave lower than cisgender feminine speaking pitch (see the chart below). 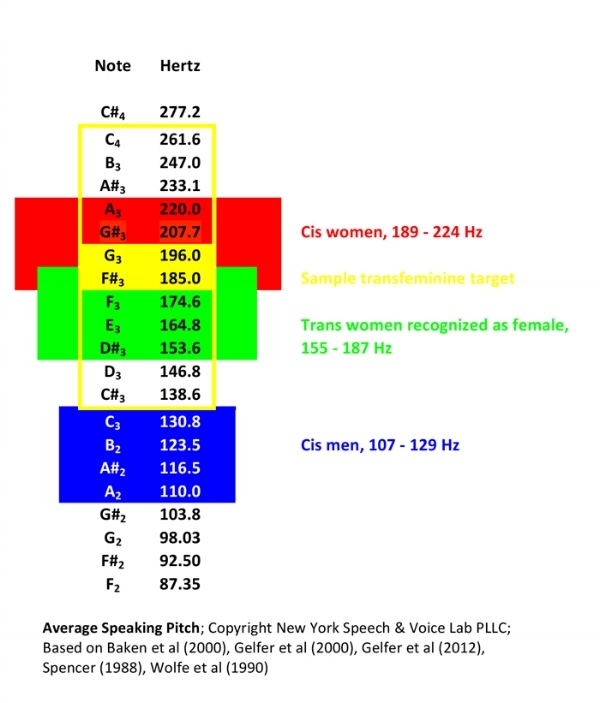 This chart also shows an example training target for an average feminine speaking pitch of 185 Hz (F#3) or 196 Hz (G3) (which may or may not apply to you). This target would allow natural pitch movement of about 12 notes in conversation. Move your pitch around more, with higher highs. Move your pitch smoothly, like rolling hills rather than sharp peaks. Blend or connect each sound with the next sound. Slide into higher pitches to avoid voice breaks and hard voice onsets. End on a slightly higher pitch at the ends of sentences when the meaning allows it. Many people have heard that resonance can make the difference between sounding naturally feminine and sounding like a man with a high pitch. But what IS resonance? It is the reverberation of sound in a space. For humans, that space is in our chest, neck, and head. If you have a larger head and neck, your voice may sound bigger, darker, or boomy. An analogy is the difference in tone between a cello and a violin. Luckily, resonance is not solely affected by biology (size), it's how you use it. So, it's possible to sound more like a violin even though you have the body of a cello. To do so, you aim to utilize less of your vocal space by shifting the placement of your vocal energy and tongue, so that your voice sounds smaller, brighter, or less boomy. Try to aim your vocal energy forward, in the mask of your face, to reduce the reverberation of the voice in the back of the head. Subtle movements of the tongue can also restrict space in the mouth and throat. Resonance can be difficult to learn, but once you get it, it can make a big difference. Vocal quality can be an important component of a feminine voice. Many trans women try to be breathy, giving their voice a soft quality. This is sometimes or even often unnecessary, but because it is relatively easy to do, it suits some people. If it suits you, be sure not to be too breathy, which can sound unnatural or make it hard to be loud when you need to be. Feminine articulation is sometimes perceived to be lighter than masculine articulation. Studies show that women hold their tongues in a more anterior position in the mouth. To achieve this, aim for more precise movement of the tongue and lips, and notice your tongue moving in the front of your mouth. Also try to widen your lips into more of a smiling position. Feminine speech can sometimes be perceived as less loud than masculine speech. Being a little quieter during conversational speech is fairly easy to do. Remembering to be quieter or choosing which situations are suitable for quieter talking is more of the challenge! Stereotypical women’s language, relative to men’s, is commonly characterized as being more polite, being less direct, interrupting less, or elaborating more, among other things. In reality, language, more than voice, varies widely depending on the person, the situation, and other possible aspects of your identity, including your age, your relationship to your listener, your socioeconomic class, your ethnicity, the region you live in, the social context you are speaking in, etc. These various factors will likely become more or less important depending on the situation. So, rather than uniformly using stereotypes, you should carefully consider your particular speaking situation in order to determine what kinds of words and how many words you should use, and what your conversation style should be. What is considered appropriate communication behavior in a particular situation? Is a typically feminine style important in that situation? What kind of communication style do you want generally, and how do you apply that depending on whether you are in a work meeting vs. with your best friend vs. with your dog? Believe it or not, you can change how you laugh, cough, throat clear, and sneeze! A more feminine sound can be achieved by aiming for a higher pitch, a higher tongue, wider lips, and/or decreased loudness. It is possible to modify your singing pitch range to a certain extent. I provide counseling regarding general expectations for singing in your case, utilize singing for speaking voice as necessary, and get you ready to see any of a number of singing teachers who are familiar with transgender voices. In addition to teaching technical stills, I provide counseling regarding how you are feeling and thinking about your voice in the process of voice change. Sometimes mental obstacles are harder than the technical skills. I help you to address issues as they arise. Some may include staying mindful of your voice during daily interactions, accepting your best possible voice as part of your best feminine self, trying out new types of vocal behaviors even if they feel silly or strange at first, having the courage to use your modified voice in public or with certain people, coordinating your voice use with other changes in gender expression, or addressing how to manage new societal expectations or sexism when you are recognized as female in conversation. I help to navigate your thoughts and feelings to help you make the right steps for your voice at the right time for you. Phonosurgery is becoming more available as an option to address pitch. Voice training is almost always enough to achieve a more feminine voice, but in some cases, a person will feel that phonosurgery is a good choice for them. Because pitch-raising surgery only addresses one aspect of feminine voice, and because it still commonly results in permanent complications that require rehabilitation afterwards, voice training is still a recommended part of voice intervention when phonosurgery is done, even if limited. For many people, voice training is good to try first, as a trial to see how far you can get and as a way to manage vocal awareness, strategies, technical skills, and using your voice in various contexts in daily life. If you are considering pitch-raising phonosurgery, I provide you with information regarding the benefits and limitations of pitch-raising surgery, and I explain how it can apply to you and your goals and be integrated with other aspects of your voice and gender expression. I coordinate care with your surgeon, whether they are local or abroad, by providing counseling regarding expectations and voice rest, taking samples and images, tracking changes, and giving progress updates. In addition, I provide exercises to maximize results, which typically target pitch range, efficient vocal production, vocal stability, and vocal endurance, in addition to other aspects of voice that interact with pitch. Whether to do pitch-raising phonosurgery is a serious decision, particularly since it is still considered fairly risky. I do my best to help you make an informed decision for yourself and help you through the whole process if that is the path you choose. Hum your target pitch, such as G3 196 Hz, whenever you think of it, in order to adapt your ear and your voice to a higher speaking range. Avoid yelling, screaming, or long periods of talking can be harmful to your voice, and can lead to tissue changes in the vocal folds. Use a lighter vocal quality when alternating “ah” and “ha” many times slowly. Feel the airflow from the “h.” Then read aloud, listening carefully as you add in a little more airflow without being too breathy. Think of someone who you feel has a nice, feminine conversation style in social situations. What do you like about it? Is it the words they choose? how much they talk? how much they listen? how much eye contact they have? How does your conversation style compare in that same kind of situation?